The Business Unipörs in black leather – an elegant premium accessory. 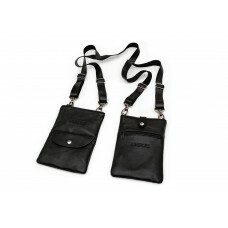 A Unipörs consists of one adjustable strap and two pockets. One pocket has a snap button on top, and an outer pocket with zipper. The other one has a zipper on top, and a small outer pocket, closing with a snap button. This model contains no magnets. Strap size: one size fits all, adjustable, about 95 cm across excluding the swivel hooks. Pocket material: Shell: 100 % leather, fabric lining. Color: black, both pocket and strap. This product is handmade, so the structure and the hue may vary a bit. Swivel hooks and adjusters on the strap: nickel-free metal in silver color. Production: designed in Sweden, handmade in Dnipro, Ukraine. Care: Wipe with a damp cloth. Use leather detergent only, do not use strong detergents. Payment: we accept PayPal and Credit/Debit Card payments. To pay with card: choose "PayPal" as alternative, and during the next step you get the choice to either log in - or pay with card directly. Shipping is included in product price, within Sweden. We ship globally, a flat rate is added at checkout. What to use the Unipörs for? Any mobile device which is less wide than 100 mm will fit into your Unipörs. That includes all modern phones that we tested with, including Iphone 7+ and Samsung S8+. The pocket that closes with zipper has a slightly smaller opening, but the other one swallows your phone and makes it easier to grab it, with just a snap button to undo. We have designed Unipörs so vital medical accessories such as an allergy pen or diabetics injectors will also fit, and be very easy to access. Your passport will fit, together with most documents needed for travels - and you will not be an easy prey for pickpockets. If you carry it under your jacket, then they will not even know it's there. You can easily remove the Unipörs in the security check at the airport, and then put it back on. You can also remove it together with the jacket, and put everything back on so it will be invisible. Unipörs does not show under jackets or suits. If you're small in size, or if you are wearing something very thin, or if you have a waist belt, then we recommend to wear Unipörs adjusted high up under the arms. In that way, it will not affect your silhouette. Otherwise, you can show it off by wearing over your jacket, not under. The Unipörs strap consists of one longer and two shorter pieces. Let the points where they meet up rest on the back of your shoulders, the smooth side towards your back. The shorter strap pieces go backwards, over your shoulder blades. The adjusters should face outwards for easy use. The pockets can be attached in any way - you can choose which one you want on which side, facing either way you want. Some like to put it on “like a t-shirt” – put your arms through the strap loops and put the backpiece over your head. Some put it on like a coat – hold it by the backpiece, and then thread one arm through, then the other. What’s important is that you make sure that the straps, especially the backpiece, are not twisted. Adjust the strap the front and back for a perfect individual fit. Generally, you want the pockets to be on the same level, some part of them touching your elbows. To check that it’s not too tight, let the pockets hang at least a hand’s width below your armpit. That makes it easy to reach into the pockets, with either hand. If the shoulder strap feels too close to your neck, try adjusting the Unipörs in the front and the back to create a comfortable fit for you. Feel free to experiment with the shoulder strap length for different outfits and activities. - If you are running, horse-riding or using your Unipörs during other physical activities, it can be more comfortable to keep the pockets a bit higher, so they stay wedged between your arms and your body. During running, Unipörs is wedged between the arms and the core of your body, so it's stable enough, but will not chafe. If you run with your arms raised, however, you might want to clip it to your belt somehow. Another alternative is to wear it under a jacket. 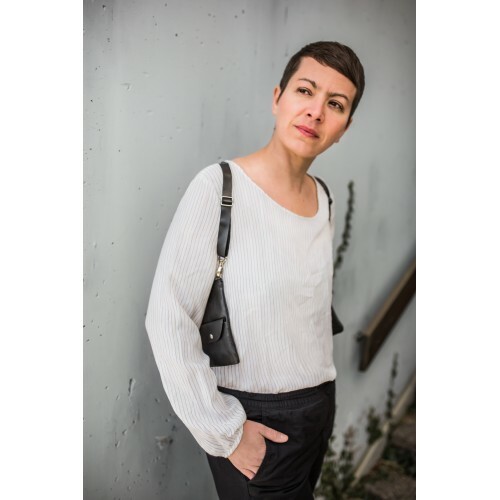 - If you wear your Unipörs under a garment with a waist belt, or a garment that is very tightly fitting, it’s also a good idea to keep the pockets high to maintain your intended silhouette – or to have it on the outside! - If you want to be able to glance inside the pockets, or barely raise your hands to reach your stuff, let the Unipörs strap be adjusted to the max, and hang down low! It will be like carrying a shoulder bag, except it will never slip or glide down. Wear it at the office, under your jacket, when climbing, camping, grilling, while gardening or chain-sawing, to the library or when shopping, or during those lazy summer days when you don't want to carry a bag, even to the beach. Use it when walking your dog, on the roller coaster, out running, at the movies, mushroom picking forest outings, at the gym, to the marketplace, under your rain coat, on the dance floor, under your blazer, while travelling by air, in the car, while commuting, playing with the kids or the dog, or when public speaking - put the mic battery in your Unipörs! Wear it together with your backpack, wear it to the important business meetings, fill it with business cards for the gala mingle, wear it while riding a bike and/or motorcycle, meditating and anywhere else when you need to know where your important things are while keeping your hands free.